credit: srqpix (Flickr)Hi everyone. My name is Jess Downey and I’ve never been a lover of Valentine’s Day. And I know what you’re thinking because I’ve heard it all before — I’m a hater, anti-love, or anti-romance (or all three at once). I swear none of those things are true; I’m just not all that into conventional notions of romance. But when you have a boyfriend, it’s not as easy to say “whatever” on February 14th. And let’s be serious: celebrating the holiday, no matter how big (or small) you do it, can be fun. 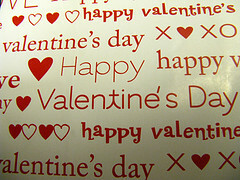 Don’t hide how you feel, but don’t be overtly anti-Valentine’s Day. You might want to throw up in your mouth a little at the thought of chocolate and candy hearts, but remember that your guy or gal might be in love with all of the cheese. Find a way to gently tell your boo how you feel and come to a common agreement about something you can do that pleases you both. If you DO want to celebrate, do something that suits you as a couple. If you’re not the expensive roses, dinner, or giant life-size teddy bear kind of couple, that’s OK. There’s no need to give in to all the Valentine’s Day pressure (and hype). Go out and see a scary movie, cook dinner together at home, or play in the snow if it's on the ground. Do whatever feels romantic to you. If you DON’T want to celebrate it, don’t! Of course, on the flip side, you might not want to celebrate the holiday, and that’s OK, too. As long as you’re both on board for the non-plan plan, it’s totally fine to treat the day as any other. You never need an excuse to show your love! And above all, don’t stress out. Don’t worry about planning the perfect date or the getting your guy or gal the best. Present Ever. It’s just Valentine’s Day, and chances are you’ve already impressed him or her since you’re together. There are always opportunities for romance. Just be yourself and have fun! What are your Valentine’s Day plans? Share with fellow readers below!